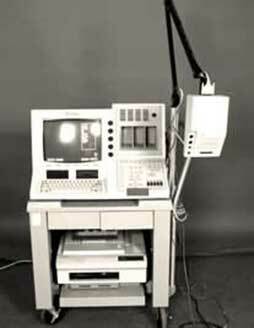 This is a picture of an EMG machine. It has several wires that are attached to electrodes inserted with small needles into the muscles of your arm or leg. It has a recording facility that measures the flow of electricity in your nerves to identify which of these nerves are being compromised. This is a test of the electric conductivity of the nerves of the body. This can be done by measuring the transit time in nerves and measuring the response in the muscles that are supplied by these nerves. The measuring instrument is a small needle that is placed in the muscle and then connected to a machine that measures very small electric impulses. When your specialist receives a report that there is slowing in transit time in one of the nerves, this may indicate, among other things, that the nerve is being compressed by a lesion like a slipped disc.